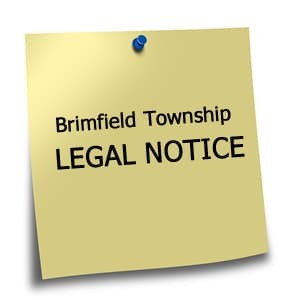 The Brimfield Township Board of Zoning Appeals will have a public hearing on Wednesday, February 21, 2018 at 7:00 PM at the Brimfield Township Town Hall, 1333 Tallmadge Road Brimfield Township, Ohio 44240. The agenda will include the following: Work Session to provide information to Board regarding possible future amendments, possible future appeals, update on Brimfield Township Zoning Department. Filed by Brimfield Township Secretary, Jendy Miller.